Pectin is a major component and structural polysaccharide of the primary cell walls and middle lamella of higher plants. Pectate lyase (PEL, EC 4.2.2.2), a cell wall modification enzyme, degrades de-esterified pectin for cell wall loosening, remodeling and rearrangement. Nevertheless, there have been few studies on PEL genes and no comprehensive analysis of the PEL gene family in cotton. We identified 53, 42 and 83 putative PEL genes in Gossypium raimondii (D5), Gossypium arboreum (A2), and Gossypium hirsutum (AD1), respectively. These PEL genes were classified into five subfamilies (I-V). Members from the same subfamilies showed relatively conserved gene structures, motifs and protein domains. An analysis of gene chromosomal locations and gene duplication revealed that segmental duplication likely contributed to the expansion of the GhPELs. 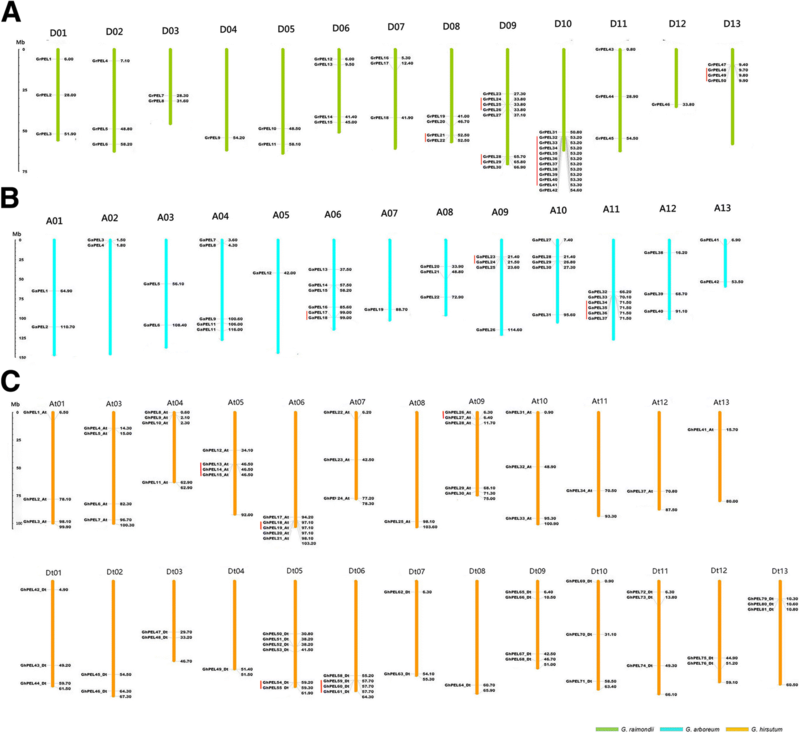 The 2000 bp upstream sequences of all the GhPELs contained auxin response elements. A transcriptomic data analysis showed that 62 GhPELs were expressed in various tissues. Notably, most (29/32) GhPELs of subfamily IV were preferentially expressed in the stamen, and five GhPELs of subfamily V were prominently expressed at the fiber elongation stage. In addition, qRT-PCR analysis revealed the expression characteristics of 24 GhPELs in four pollen developmental stages and significantly different expression of some GhPELs between long- and short-fiber cultivars. Moreover, some members were responsive to IAA treatment. The results indicate that GhPELs play significant and functionally diverse roles in the development of different tissues. In this study, we comprehensively analyzed PELs in G. hirsutum, providing a foundation to better understand the functions of GhPELs in different tissues and pathways, especially in pollen, fiber and the auxin signaling pathway. Plant growth and development along with cell expansion and division give rise to the morphogenesis of many organs, tissues and cells . The cell wall is a significant structure that maintains the cell’s internal pressure, stability, tensile strength and defense . Pectin, which is mainly present in the primary cell wall and middle lamella, is a polysaccharide containing a linear backbone of α-1,4-linked galacturonic acid residues that forms a matrix embedded in cellulose and hemicellulose [3, 4]. Homogalacturonan (HG), a major component of pectin, can be degraded by various pectinases, including the polygalacturonases (PGs), pectin acetylesterases (PAEs), pectin methylesterases (PMEs) and pectate lyases (PELs) . PEL, (EC 4.2.2.2) depolymerizes HG through a β-elimination reaction, generating 4,5-unsaturated oligosacceharides [6, 7]. PELs have been widely identified in plant pathogenic bacteria, such as Erwinia chrysanthemi, which causes soft-rot disease in many plants . In many higher plants, expression of PEL-like genes has also been found in a variety of tissues, including the pollen of tomato, tobacco and Japanese cedar [9–11], ripening fruits of strawberry and banana [6, 12–14], tracheary elements of Zinnia , fiber of cotton , xylem of poplar  and lateral roots of Arabidopsis . In Arabidopsis, a genome-wide analysis and an analysis of promoters showed that PEL-like genes (AtPLLs) play an important role in the development of flowers and cell separation [19, 20]. In pollen development, PELs may regulate the loosening and degradation of the pollen cell wall . In the process of fruit ripening, PELs modify the pectin structure in the cell wall . In Populus, most of the 30 PtPLs are highly expressed in xylem, performing important functions during the development of wood . In Arabidopsis, the increased expression of AtPLAs (PEL genes) promotes the degradation of the pectin-rich middle lamella during lateral root emergence . In rice, the DEL1 gene (a PEL gene, LOC_Os10 g31910) regulates plant growth and leaf senescence through controlling cell numbers and triggering reactive oxygen species accumulation . Auxin, an important plant hormone, regulates plant growth and development by advancing acid-mediated changes in the cell wall [21, 22]. The acidification of the cell wall activates the expansins and PMEs, which causes loosening of the cell wall . Many studies have revealed that PELs respond to IAA treatment [13, 18, 19, 23, 24]. These studies indicate that PEL genes exhibit extensive functions in plant growth and development and participate in the auxin regulation pathway. Cotton is the most important natural fiber crop. Pectins are responsible for 25% of the cell wall components of rapidly elongating cotton fibers (8 days postanthesis (DPA)), indicating that the structure and configuration of pectin can influence fiber quality [25, 26]. A study examining GhPEL indicated that this gene is crucial for the normal elongation of cotton fibers through degradation of de-esterified pectin, facilitating the loosening of the cell wall . However, there have been few studies related to PEL genes in plants, and they have mainly focused on the functional analysis of individual genes. In cotton, most of the PEL genes are unknown. At present, there are no available genome-wide analyses of the cotton PEL gene family. With the completion of the genome sequencing of G. raimondii, G. arboreum and allotetraploid cultivated cotton (G. hirsutum cv TM-l), we can now perform a comprehensive analysis of PELs in cotton [27–31]. 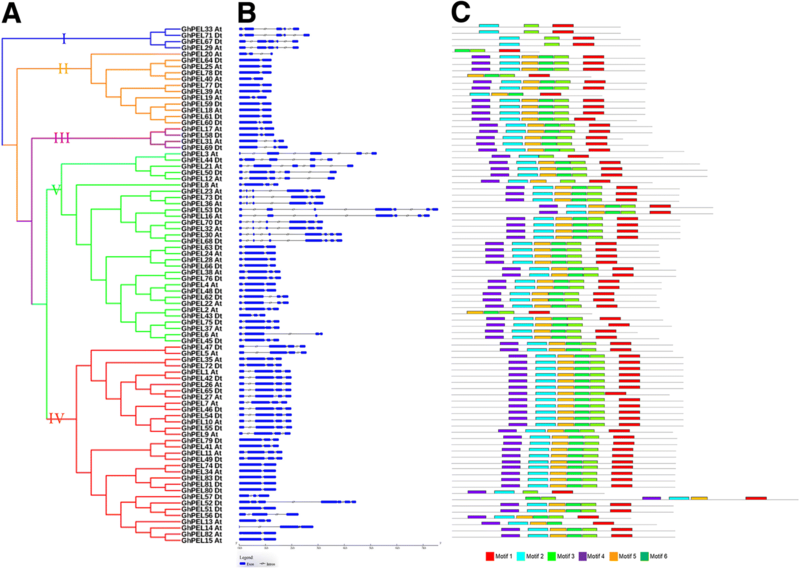 In this study, we predicted the PELs of three Gossypium species and analyzed their gene structure, phylogenetic tree, expression characteristics and other features. The results provide a reference for the potential functions of PELs in plant growth and development. Based on the conserved Pec_lyase_C (Pfam00544) domain and SMART analyses, we identified 53, 42, and 83 full-length putative PELs in G. raimondii, G. arboreum and G. hirsutum TM-1, respectively. According to their locations on the chromosomes, the family members of the three species were designated GrPEL1 to GrPEL53; GaPEL1 to GaPEL42; and GhPEL1 to GhPEL83, respectively. 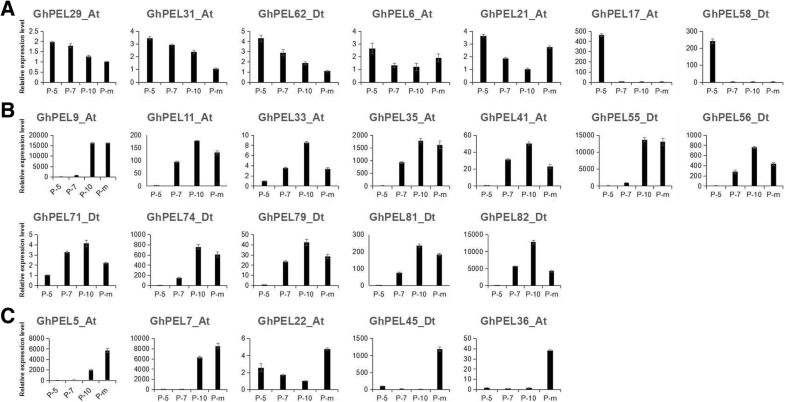 The lengths of the putative GhPEL proteins varied from 171 (GhPEL20_At) to 680 (GhPEL52_Dt) amino acids (aa), while those of GaPELs ranged from 136 aa (GaPEL36) to 680 aa (GaPEL14), and those GrPELs varied from 222 aa (GrPEL36) to 511 aa (GrPEL27). The predicted Mw, pI, GRAVY and subcellular localization of the protein sequences are shown in Additional file 1: Table S1. 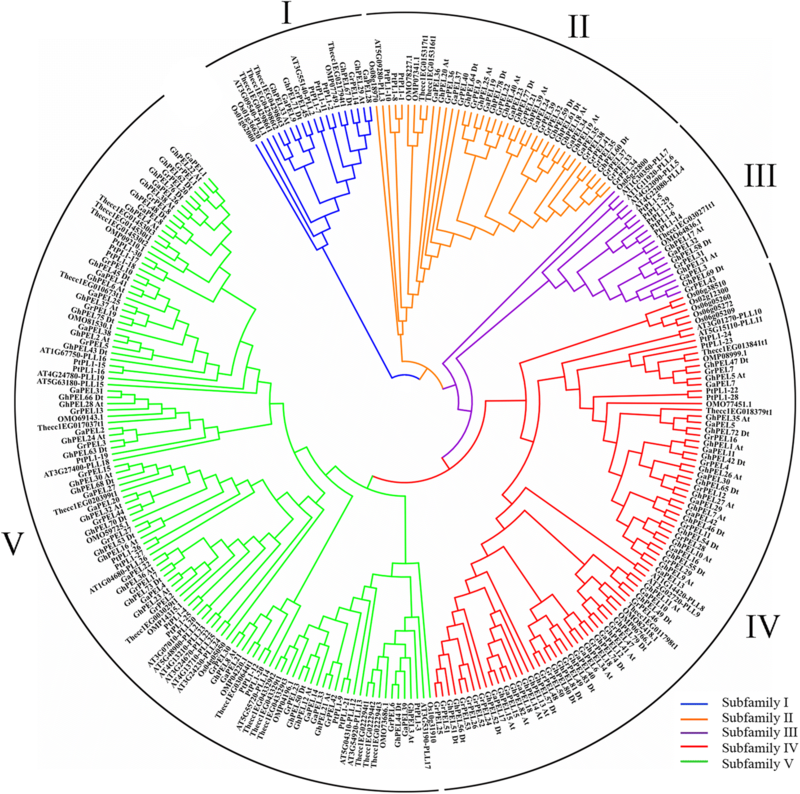 To examine the evolutionary relationships of the PEL proteins and classify them into subfamilies according to the established subfamilies in Arabidopsis, we performed a phylogenetic analysis of 285 PEL protein sequences from G. raimondii (53), G. arboreum (42), G. hirsutum (83), Arabidopsis thaliana (26), Corchorus olitorius (16), Theobroma cacao (24), Oryza sativa (11) and Populus trichocarpa (30) to construct an unrooted phylogenetic tree. The PEL proteins were classified into 5 subfamilies (I, II, III, IV and V) (Fig. 1 and Additional file 2: Table S2). Subfamily IV and subfamily V were the two largest subfamilies and contained 101 and 103 PEL members, respectively, while both subfamily I and subfamily III contained only 20 PEL members. The PEL proteins of Oryza sativa, a monocot, were distant from the PEL proteins of the other dicot plants. These results indicated that PELs might have evolved in different directions and expanded to exhibit diverse functions among various species. The chromosomal distributions of GrPELs, GaPELs and GhPELs were determined according to their genomic locations (Additional file 3: Table S3). In G. raimondii, 50 GrPELs were unevenly anchored on 13 chromosomes, while 3 genes (GrPEL51-GrPEL53) were located on scaffolds. D10 contained the most GrPELs (12), followed by D09 with 8 GrPELs. However, there was only one GrPEL on D04 and D12 (Fig. 2a). In G. arboreum, 42 GaPELs were located on 13 chromosomes. Both A06 and A11 contained the most GaPELs (6 each). In contrast, both A05 and A07 only contained one GaPEL (Fig. 2b). A total of 71 GhPELs were mapped to the 25 G. hirsutum chromosomes, with the exception of At02, while 12 other GhPELs were located on unassembled scaffolds. The distribution of GhPELs on each chromosome was highly uneven: D05 contained the most GhPELs (7); At06 and At09 contained 5 GhPELs; and the other 22 chromosomes contained one to four GhPELs (Fig. 2c). Previous studies have indicated that gene duplication events are vital to gene family expansion and occur along with plant genome evolution . In the present study, a gene duplication analysis was performed to investigate the expansion mechanism of the PEL gene family in the three Gossypium species. In general, gene duplication events include tandem and segmental duplications. A total of 14, 13 and 35 gene duplication pairs were identified in G. raimondii, G. arboreum and G. hirsutum, respectively, accounting for 71.7%, 66,7% and 86.7% of the PEL gene family (Additional file 4: Table S4). Based on sequence similarity and chromosomal location, 5, 3 and 5 gene duplication pairs were determined to represent tandem duplication events in G. raimondii, G. arboreum and G. hirsutum, respectively, while 49 other pairs represented segmental duplication events; these pairs are shown in Fig. 3, except for the gene pairs located on unassembled scaffolds. A total of 13 clusters of tandem duplication were located on D08 (GrPEL21/GrPEL22), D10 (GrPEL32-GrPEL41), D13 (GrPEL48-GrPEL50), D09 (GrPEL24-GrPEL26 and GrPEL28/GrPEL29), A06 (GaPEL17/GaPEL18), A09 (GaPEL23/GaPEL24), A11 (GaPEL34-GaPEL37), At05 (GhPEL13_At-GhPEL15_At), At06 (GhPEL18_At/GhPEL19_At), At09 (GhPEL26_At/GhPEL27_At), Dt05 (GhPEL54_Dt/GhPEL55_Dt) and Dt06 (GhPEL59_Dt-GhPEL61_Dt) (Fig. 2). 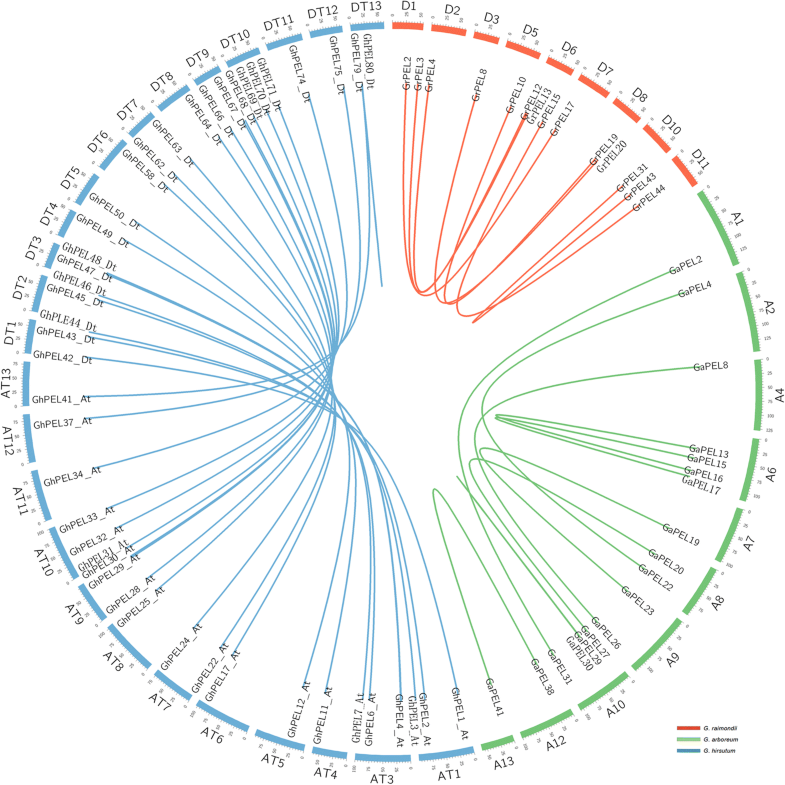 These results indicated that gene duplication, especially segmental duplication, played an irreplaceable role in the expansion of the PEL gene family in the three Gossypium species. To investigate the selection pressure for the segmental duplication of PEL gene pairs, the Ka/Ks ratio was calculated. The results showed that the Ka/Ks ratios for most of the segmental duplications of PEL gene pairs were less than 1.0, indicating that they had experienced purifying selection pressure after gene duplication events (Additional file 5: Table S5). Because of the constraints of purifying selection on divergence, most of the segmental duplications of the PEL pairs might exhibit similar functions. Only GhPEL2_At/GhPEL43_Dt presented a Ka/Ks ratio greater than 1, demonstrating that this GhPEL pair had undergone positive selection during cotton evolution. In addition, divergence time analysis was performed between the segmentally duplicated PEL pairs (Additional file 5: Table S5). In G. raimondii and G. arboreum, the timing of the occurrence of the segmental duplication of PEL pairs was inferred to be 8.48–171.46 million years ago (MYA), with an average of 91.73 MYA, and 18.35–145.46 MYA, with an average of 85.73 MYA, respectively. In G. hirsutum, the timing of the occurrence of the segmental duplication PEL pairs was presumed to be 1.00–32.75 MYA, with an average of 10.24 MYA. The Pec_lyase_C domains and signal peptides of the PEL sequences were investigated and shown according to the phylogenetic tree of the GhPELs (Additional file 6: Figure S1). All of the GhPELs contained a Pec_lyase_C domain, indicating that this domain was conserved. Four Asp residues, one Cys residue, one Arg residue, and five additional amino acid residues (Asp, His, Thr, Pro and Arg) in the Pec_lyase_C domain involved in Ca2+-binding, disulfide bonds, catalysis and substrate binding, respectively, were found to be highly conserved, indicating that these amino acid sites were significant for the function of GhPELs (Additional file 7: Figure S2). Most members of the GhPELs (77.1%) exhibited the predicted signal peptide. However, the members of subfamily I exhibited no signal peptide, which was consistent with a previous study on PtPLs . To further understand the conservation and diversification of the GhPELs, their exon-intron structures and conserved motifs were investigated and were shown in Fig. 4. The members of subfamily I and subfamily III each contained 5 exons and 3 exons, respectively. Most members of subfamily II exhibited 2 exons, except for GhPEL20_At, GhPEL19_At and GhPEL60_Dt, which presented 3 exons. More than half (17/32) of subfamily IV contained 4 exons, while the other members displayed 2 or 3 exons, with the exception of GhPEL52_Dt, with 7 exons. The exon numbers of subfamily V members varied from 3 to 7. The exon numbers were highly diverse among GhPELs (ranging from two to seven), indicating that functions of GhPELs might be diverse. However, closely related GhPELs showed similar exon-intron structures, and these genes might play similar roles in plant growth and development (Fig. 4b). We identified 6 conserved motifs of the GhPEL proteins using MEME (Fig. 4c). Within a given subfamily, most of the members exhibited similar motif construction. Motifs 1, 5, 3 and 6 within the conserved Pec_lyase_C domain were identified in most of the GhPEL proteins. A total of 90.4% of the GhPEL proteins (except for the members of subfamily I and GhPEL20_At, GhPEL40_At, GhPEL19_At, and GhPEL43_Dt) contained motif 4. Motif 2 existed in 96.4% of the GhPEL proteins (except for GhPEL20_At, GhPEL40_At, and GhPEL43_Dt). Taken together, the motifs and their arrangement showed a high conservation in the GhPEL family. Many studies have shown that PELs respond to auxin treatment. Therefore, the 2000 bp upstream regions from the initiation codons (ATG) of GhPELs were scanned in the PLACE database to obtain the cis-acting elements related to auxin. The results showed that all of the putative GhPEL promoter regions contained at least one of the six major auxin-responsive cis-elements: S000024, S000026, S000270, S000273, S000360, and S000370. In addition, the putative promoter region of GhPEL63_Dt contained the largest number (15) with all six auxin-responsive cis-elements. Ca2+- mediated crosslinking of demethyl-esterified HG, the substrate of PEL, can change cell wall structure, which is important for cell expansion and division . A Ca2+-responsive cis-element (S000501) and calmodulin-binding/CGCG box (S000507) were identified in 35 (42.2%) of the putative promoter regions of GhPELs (Additional file 8: Table S6). This result indicated that some GhPELs might alter the configuration of the cell wall with Ca2+. To explore the possible biological functions, the spatio-temporal expression patterns of GhPELs were investigated in different tissues, including root, stem, leaf, petal, stamen, pistil, ovules and fibers at various developmental stages. Using the transcriptome datasets of G. hirsutum (TM-1) , the expression profiles of 62 GhPELs with FPKM ≥1 in at least one of the 8 investigated tissues were shown in Fig. 5. The other 21 GhPELs, including all of the members (12) of the subfamily II, were very low or not expressed in all of the investigated tissues and developmental stages and 15 genes from gene duplication events, indicating that functional redundancy or pseudogenes existed in the GhPEL family. Based on a clustering analysis, the 62 GhPELs were divided into 4 major patterns (A-D) (Fig. 5). Cluster A contained 29 genes, all belonging to subfamily IV and dominantly expressed in the flower, especially in the stamen, with very low expression in other tissues. 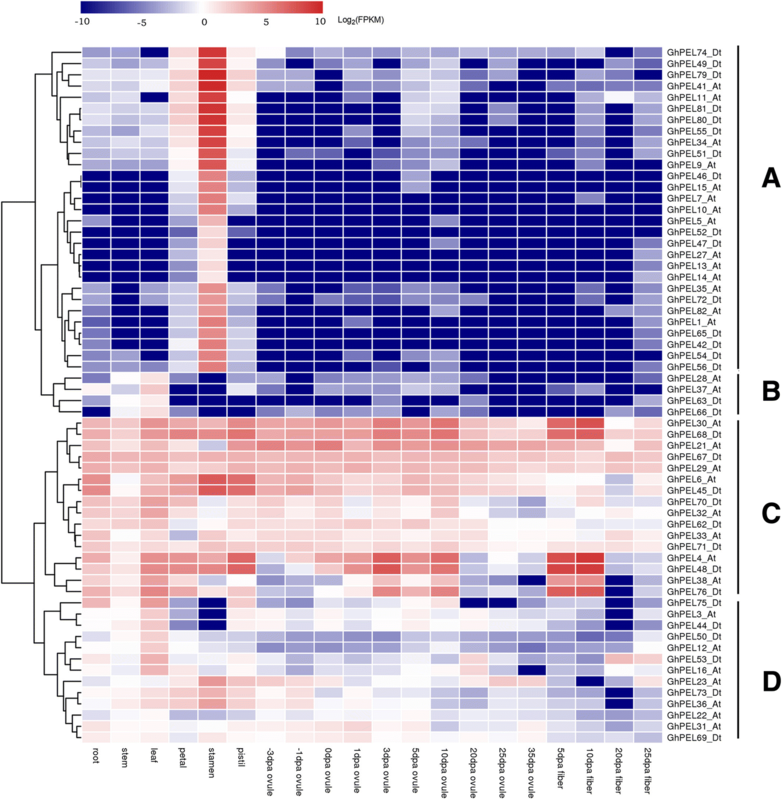 In cluster B, all 4 GhPELs (GhPEL28_At, GhPEL37_At, GhPEL63_Dt and GhPEL66_Dt) from subfamily V were shown to have higher expression levels in the leaf than in other tissues. Cluster C contained 16 GhPELs from subfamily V and I general expression in all of the tissues, with some genes primarily expressed in fiber, stamen and other tissues. Cluster D was composed of another 13 GhPELs, from subfamily V and III, with lower expression in fiber than vegetative and reproductive organs. The gene expression pattern could manifest functions of genes, in part. The dominant expression of GhPELs in cluster A indicated that these genes performed crucial and conserved functions in the development of the flower, especially the stamen, which was concordant with PLLs generally expressed in flower and several PLLs highly expressed in pollen in Arabidopsis . Some GhPELs in cluster C, including the GhPEL gene (GhPEL48_Dt) that was reported to regulate fiber elongation , showed higher expression in fiber than other tissues, which hinted that these GhPELs might regulate fiber development. To explore the expression features of GhPELs in anther development, using qRT-PCR, we identified the expression of 24 GhPELs in four stages of anther development, including meiosis stage, mononucleate stage, binucleate stage and mature stage (Fig. 6). The expression levels of 7 GhPELs (GhPEL29_At, GhPEL31_At, GhPEL62_Dt, GhPEL6_At, GhPEL21_At, GhPEL17_At and GhPEL58_Dt) were highest in the meiosis stage and decreased in subsequent stages, especially GhPEL17_At and GhPEL58_Dt with plummeting expression after the meiosis stage (Fig. 6a). Twelve GhPELs showed a constantly increasing expression to a peak at the binucleate stage, then decreased at the mature stage (Fig. 6b). The remaining 5 genes (GhPEL5_At, GhPEL7_At, GhPEL22_At, GhPEL36_At and GhPEL45_Dt) exhibited higher levels at the mature stage than at the other three stages, especially GhPEL36_At, which displayed a very low expression at the other three stages except for the mature stage (Fig. 6c). These results indicated that some GhPELs performed various and significant functions in the different development stages of anthers. Two cultivars with significantly different fiber lengths (TM-1, with longer fibers, and kenN27–3, with shorter fibers) were chosen to explore the function of GhPELs in fiber development . The expression of 7 genes (GhPEL4_At, GhPEL48_Dt, GhPEL30_At, GhPEL68_Dt, GhPEL76_Dt, GhPEL38_At, and GhPEL53_Dt), most of which exhibit higher expression in fiber than other organs, was analyzed in 10 DPA, 15 DPA, 20 DPA and 30 DPA fibers of TM-1 and kenN27–3. The results revealed that 5 genes (GhPEL4_At, GhPEL48_Dt, GhPEL30_At, GhPEL68_Dt and GhPEL76_Dt) displayed higher expression levels in TM-1 than in kenN27–3 in all stages and showed a significant difference in at least one stage, especially in the rapid elongation stage of fiber (10 DPA and 15 DPA) (Fig. 7a). GhPEL38_At and GhPEL53_Dt exhibited remarkably higher expression in fiber elongation stages and lower expression in the secondary wall thickening stage in TM-1 than kenN 27–3 (Fig. 7b). According to these results, these GhPELs might play an important role in fiber elongation. Studies have shown that auxin can regulate the activity of PEL [18, 19, 23]. Therefore, the expression features of 16 GhPELs were explored after IAA treatment (Fig. 8). Seven genes were notably up-regulated, and eight genes were notably down-regulated, mainly at 6 h and 12 h (Fig. 8a, b). The expression of GhPEL67_Dt showed notably earlier down-regulation and then up-regulation in response to IAA treatment at 3 h and 6 h, respectively (Fig. 8c). These results indicated that some GhPELs might take part in the biological pathways regulated by auxin. Previous studies on PEL genes have mainly been conducted in plant pathogenic bacteria, focusing on pathogenic mechanisms [8, 35]. However, PEL-like genes have also been found in many plants, with genome-wide analyses revealing 26 PEL homologous genes in Arabidopsis, 12 in Oryza sativa, 46 in Brassica rapa and 30 in Populus trichocarpa [17, 19, 20, 36]. In the present study, a smaller number of PEL genes was identified in Oryza sativa (12 to 11), ignoring the Os06 g38520 genes due to exceeding the threshold (1e-10). We also identified 53 PEL homolog genes in G. raimondii, 42 in G. arboreum and 83 in G. hirsutum; these numbers are larger than those reported in most other species, indicating that gene expansion has occurred in the PEL gene family, especially in the IV and V subfamilies, during the evolution of cotton genomes. Gene duplication events have been reported to play an important role in gene expansion and both functional conservation and novelty in gene families [37, 38]. Our analysis of gene duplication in three cotton species showed that gene expansion in G. hirsutum and G. arboreum likely resulted primarily from segmental duplication (72.3% and 47.6%), whereas in G. raimondii, it resulted almost equally from tandem and segmental duplication (Additional file 5: Table S5). Genomic studies of cotton have revealed that two whole-genome duplication (WGD) events occurred in both G. arboreum and G. raimondii, one ancient and one recent event, at approximately 115–146 and 13–20 MYA, respectively [27–29]. Subsequently, polyploidization of A and D diploids and the emergence of G. hirsutum occurred, approximately 1–2 MYA . In our study, analysis of the timing of the occurrence of segmental duplications showed that most of the events observed in G. raimondii and G. arboreum might have occurred from 8.48–145.46 MYA, except for GrPEL3/GrPEL13 (148.15 MYA) and GrPEL31/GrPEL43 (171.46 MYA), suggesting that these duplication events might have derived from the two WGD events. In G. hirsutum, the segmental duplication events most likely occurred before the hybridization of the two extant ancestors, according to the range of divergence times (1.00–32.75 MYA) and average time (10.24 MYA). The uneven chromosomal distribution of the PEL genes in the three cotton species might be due to the occurrence of these gene duplication events in the evolution of cotton. Phylogenetic analysis indicated that the PEL genes could be classified into five subfamilies, with the largest members in subfamilies IV and V (Fig. 1, Additional file 2: Table S2). The PELs of Oryza sativa were located a long distance from those of the other plants, which might be related to different functions of these proteins between monocots and dicots . All of the GhPELs exhibited the conserved Pec_lyase_C domain, with highly conserve Ca2+-binding, disulfide bonds, catalysis and substrate binding amino acid sites (Additional file 6: Figure S1 and Additional file 7: Fig. S2). The conserved motif analysis showed that the six motifs existed in most of the GhPELs (Fig. 2c). These data indicated that the GhPELs (especially the members of the same subfamily) might show a relatively conserved function in upland cotton growth. However, gene structure analysis revealed high diversity in the exon numbers of GhPELs, which could be related to diversification of their functions (Fig. 2b) [19, 40]. The similarities and differences of the gene structures, domains and motifs of GhPELs might be related to conservation and subfunctionalization, resulting from their long evolutionary history and gene duplication in cotton [37, 41]. PELs are cell wall-modifying enzymes that can cleave α-1,4-glycosidic linkages of demethylated HG, the structural polysaccharide of the primary cell walls and middle lamella in higher plants, via a β-elimination mechanism . Highly methyl-esterified HG is secreted into the extracellular matrix during cell division and is then de-esterified by PMEs. Demethylated HG is degraded by PELs and PGs more easily, promoting the loosening of the cell wall and regulating cell growth, cell division and organ morphogenesis in plant growth and development [2, 42, 43]. These findings indicate that pectinases, including PGs, PAEs, PMEs and PELs, regulate the cell wall composition and structure, playing important roles in different developmental processes of plants. Comprehensive analyses of PEL genes have been reported in Arabidopsis, Brassica rapa and Populus, with most of these genes being expressed in flowers [9, 10, 17, 19, 20, 36]. In the present study, a transcriptomic analysis of GhPELs revealed that 90% of the members in subfamily IV were preferentially expressed in the stamen, in agreement with the above reports (Fig. 5). To further explore the differences in the expression of GhPELs in anther development, we analyzed the expression of 24 GhPELs in four developmental stages of anthers, with 7, 12 and 5 GhPELs showing peak expression levels in meiosis, binucleate and mature stages, respectively (Fig. 6). These results indicated that many GhPELs performed synergistic and diverse functions in the process of anther development in upland cotton. Similar findings have been reported in Brassica rapa, in which BrPLL1, BrPLL8–1 and BrPLL11–3 were expressed only at the mature pollen stage, while BrPLL6 showed specific expression at the meiosis and tetrad stages of anthers, and in tomato, in which LAT56 and LAT59 displayed maximal expression levels in the mature anthers [9, 36]. The PELs expressed during anther development might function to facilitate the degradation of the primary cell wall in pollen mother cells (PMC) during the meiosis stage and take part in anther dehiscence, cell wall loosening in pollen, pollen tube elongation and the promotion of pollen penetration through style tissue degradation in mature anthers [11, 44–46]. Cotton fiber, which is a widely used natural fiber in the textile industry, is produced from a single differentiated epidermal cell of the ovule [47, 48]. In cotton fiber, pectin was produced beginning at anthesis, continuously through 19–20 DPA, and was only found only in the primary cell wall . Here, we explored the expression features of 7 GhPELs, including 3 paralogous gene pairs with high expression in fiber, in two upland cotton cultivars showing significantly different fiber lengths. All 7 GhPELs exhibited significantly higher levels of expression in TM1 than kenN 27–3 during the rapid elongation stage of fiber (Fig. 7). However, GhPEL38_At and GhPEL53_Dt showed lower expression at 30 DPA, which was the secondary wall thickening stage. GhPEL (GhPEL48_Dt) has been shown to play an important role in fiber cell elongation through the degradation of pectin in the primary cell wall, facilitating cell wall loosening . GhPEL4_At, GhPEL30_At, GhPEL68_Dt and GhPEL76_Dt appear to exhibit the same expression characteristics as GhPEL48_Dt, indicating that these genes might perform similar functions in fiber elongation. GhPEL38_At and GhPEL53_Dt showed expression levels at the secondary wall thickening stage that were different from those in the other 5 GhPELs, which is probably related to their different roles in secondary wall thickening in fiber. A study of PtPLs revealed that a PtPL1–18 overexpression line exhibited much thinner secondary walls than control plants, which indicated that PELs could regulate the structure of secondary walls as well as primary cell walls . All of these results indicated that these genes played a substantial role in fiber elongation and influence the quality of fiber in upland cotton. Auxin is involved in acid-mediated changes in the cell wall, inducing the expansins and pectinases, leading to cell wall loosening and organ initiation [21, 50]. Previous reports have revealed that PEL genes take part in pathway responses to auxin to regulate cell elongation and differentiation and other plant developmental processes [18, 19, 24]. According to our analysis of cis-elements, all of the GhPELs contained at least one of the six auxin-responsive cis-elements (Additional file 8: Table S6). Therefore, we randomly chose 16 GhPELs to investigate the response to IAA treatment. All of these genes showed a response to IAA treatment, primarily at 6 h and 12 h (Fig. 8). Among these genes, GhPEL30_At, GhPEL38_At and GhPEL48_Dt also participate in the development of fiber, and GhPEL62_Dt is involved in anther development, especially at the meiosis stage. Previous studies have shown that auxin regulates the development of fiber elongation and the anther at early and late stages [51–53]. Our results revealed that GhPELs likely regulate plant growth and development by responding to the IAA signal. Previous studies have shown that PEL genes play significant roles in different plant development processes, mainly by changing the cell wall composition and structure [1, 5]. PEL and pectin methylesterases can alter the cell wall composition, cell wall structure and cell wall loosening by regulating the content and status of methyl-esterified and de-esterified HG , thereby affecting plant morphology  fruit firmness, pathogen resistance , anther development  and fiber elongation . Moreover, auxin participates in molding the cell wall and could regulate PEL enzyme activity . According to our gene expression analysis, GhPELs showed diverse gene expression features in different tissues. In particular, we analyzed the expression of GhPELs in anther and fiber development and in response to IAA treatment and inferred that they played roles in these processes likely by altering cell wall composition, cell wall structure and cell wall loosening. However, the regulatory networks and functions of the GhPELs require further studies. We performed a genome-wide analysis of the PEL gene family in G. raimondii, G. arboreum, and G. hirsutum. According to analyses of phylogeny, chromosomal location and gene duplication events, PEL genes were divided into 5 subfamilies, and it could be inferred that PEL gene expansion occurred due to gene duplication. All of the GhPELs exhibited the conserved Pec_lyase_C domain, and diverse gene structures were observed among them. The analysis of expression revealed that the GhPELs showed different expression features in different organs and developmental stages and could respond to IAA treatment. These results indicated that PELs played important roles in plant growth and development, especially in anther and fiber development and the auxin signaling pathway. The results of our study provide a fundamental basis for further research on the functions of PEL genes in cotton. The conserved Pec_lyase_C (Pfam00544) domain was downloaded from Pfam (http://pfam.xfam. org)  and used to search against predicted proteins of G. raimondii (JGI_v2.1), G. arboreum (BGI_v2.0) and G. hirsutum acc. TM-1 (NAUNBI_v1.1) from the CottonGen website (https://www.cottongen.org/icgi/home), using HMMER 3.0 . We also searched the Arabidopsis genome (TAIR 10, http://www.arabidopsis.org) using the Pec_lyase_C domain. The E-value threshold for the HMMER search was set at 1e − 10 to obtain possible PEL proteins. Then, the normal mode of the SMART database (http://smart.embl-heidelberg.de/) was used to confirm every putative GhPEL protein with a Pec_lyase_C domain . Only the sequences containing a conserved Pec_lyase_C domain were employed for further analysis. The theoretical molecular weight (Mw), isoelectric point (pI), grand average of hydropathicity (GRAVY) and subcellular localization of the predicted GhPELs were predicted using ExPASy (http://cn.expasy.org/tools) and the CELLO v2.5 server (http://cello.life. nctu.edu.tw/) [58, 59]. 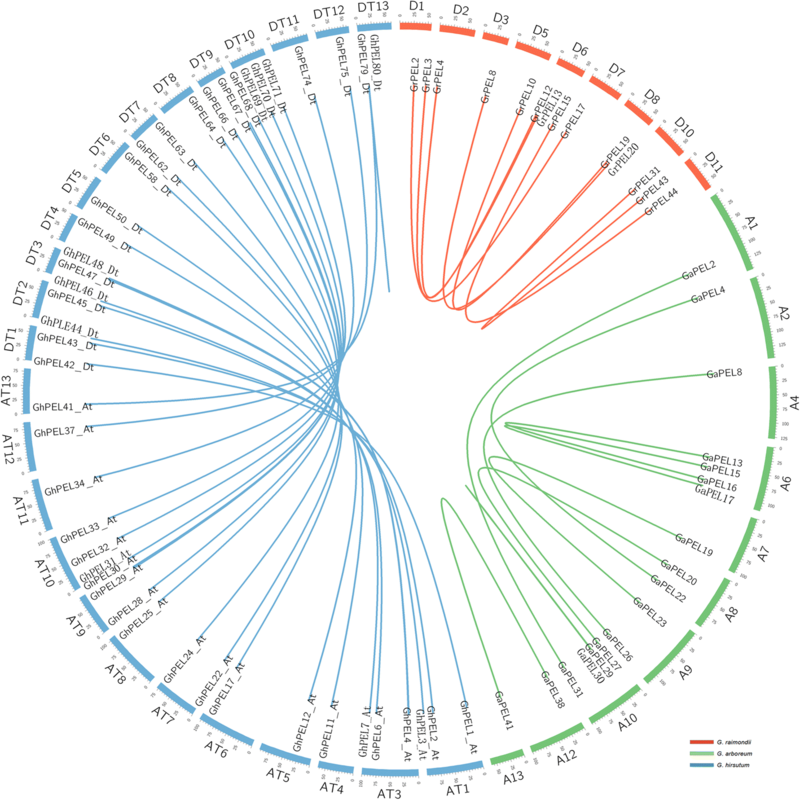 Multiple alignment of all the predicted PEL protein sequences from the three Gossypium species, Arabidopsis, Corchorus olitorius, Theobroma cacao, Oryza sativa and Populus genomes was performed using ClustalX 2.0 . An unrooted phylogenetic tree was generated using the neighbor-joining (NJ) method and the amino acid p-distance model in MEGA 6.0 . Bootstrap resamplings (1000) were used to assess the reliability of interior branches. The physical chromosome locations of all PEL genes were obtained from the genome sequence databases of the three Gossypium species and visualized with MapInspect (http://www.plantbreeding.wur.nl/uk/ software-mapinspect.html). The predicted PEL proteins of the three cotton species were aligned with ClustalW2 at EMBL-EBI (http://www.ebi.ac.uk/Tools/msa/clustalw2/). Gene duplication was confirmed if the following conditions were satisfied: (1) the coverage of the alignment was > 80% of the longer gene; (2) the identity of the aligned regions was > 80%; and (3) genes separated by five or fewer gene loci with a distance of less than 100 kb on the same chromosome were considered to represent a tandem duplication [62–64]. A diagram of segmental duplication was drawn with Circos 0.69 . Nonsynonymous (Ka) and synonymous substitution (Ks) rates were calculated using DnaSp V5.0 software, employing the full-length gene sequences of the segmental duplicated PEL gene pairs from the three cotton species aligned by ClustalX 2.0 . The Ka/Ks ratio was assessed to determine the molecular evolutionary rates of each gene pair. In general, Ka/Ks < 1 indicates purifying selection; Ka/Ks = 1 indicates neutral selection; and Ka/Ks > 1 indicates positive selection. The divergence times of these gene pairs were estimated using the formula “t = Ks/2r”, with r (2.6 × 10− 9) representing neutral substitution [30, 67]. The GhPEL protein sequences were employed for multiple sequence alignments with ClustalX 2.0. SMART was applied to determine the conserved Pec_lyase_C domains. The SignalP 4.0 server (http://www.cbs.dtu.dk/services/SignalP/) was used to predict potential signal peptides within the GhPEL proteins (cutoff > 0.45) . The genomic sequences and positions of the exons and introns of GhPELs were employed to visualize PEL exon-intron structures on the Gene Structure Display Server (GSDS) (http://gsds.cbi.pku.edu.cn/) . The MEME program was used to analyze the conserved motifs of the GhPEL protein sequences with the following parameters: site distribution, zero or one occurrence per sequence; number of motifs, 6; and motif width, 6–50 . To determine the cis-elements of the predicted promoters, the 2000 bp genomic DNA sequences upstream of the initiation codon (ATG) of all GhPELs were employed to search the PLACE database (http://www.dna.affrc.go.jp/PLACE/signalscan.html). The expression levels of GhPELs in different tissues were obtained from previously reported transcriptome data . The GhPELs with an FPKM > 1 were used for further expression analysis [71–73]. The expression clusters were calculated using Mev4.6.2 software (http://www.tm4.org/mev.html). Three G. hirsutum cultivars (TM-1, kenN 27–3 and CCRI040029) were field grown in Anyang, Henan province, China. The fibers were separated from the ovules at 10, 15, 20 and 30 DPA. The anthers of CCRI040029 were harvested when the flower buds had grown to 5 mm, 7 mm and 10 mm and at anthesis . TM-1 was also grown in a climate-controlled greenhouse (light/dark cycle: 16 h at 28 °C/8 h at 22 °C) and was employed to investigate the responses to IAA treatment. Seedlings exhibiting third true leaves were sprayed with 100 mM IAA and water as a control group. The leaves of ten seedlings in each group were collected at 0 h, 3 h, 6 h, 12 h, 24 h and 48 h after treatment. All samples were immediately frozen in liquid nitrogen and stored at − 80 °C. Total RNA of collected samples was extracted using the Tiangen RNAprep Pure Plant kit (Tiangen, China) according to the manufacturer’s instructions. First-strand cDNA was synthesized via reverse transcription of 1 μg of total RNA using the PrimeScript RT Reagent kit (Takara, Japan). Primer 5.0 software was used to design the gene-specific primers for qRT-PCR (Additional file 9: Table S7). The histone-3 gene (AF024716) was employed as an internal reference control. The qRT-PCR experiments were performed using SYBR Premix Ex Taq (Takara) on an ABI 7500 real-time PCR system (Applied Biosystems, USA) with three replicates. The details of the protocol were as follows: (Step 1) initial denaturation step of 30 s at 95 °C, (Step 2) 40 cycles of 5 s at 95 °C, 34 s at 60 °C and (Step 3) melting curve analysis. The 2-△△CT method was used to calculated the relative expression levels of GhPELs . T-tests were employed for statistical analyses. This study was performed at the State Key Laboratory of Cotton Biology at the Institute of Cotton Research of the Chinese Academy of Agricultural Sciences. This research was support by the National Key Research and Development Program of China (grant No. 2016YFD0101400). The funders had no role in the design of the study, the collection, analysis, and interpretation of data, and in writing the manuscript. The genomic databases of three cotton species G. raimondii (JGI_v2.1), G.arboreum (BGI_v2.0) and G. hirsutum acc. TM-1 (NAUNBI_v1.1) are available from the CottonGen website (https://www.cottongen.org/icgi/home). The Arabidopsis genome was obtained from the TAIR 10 (http://www.arabidopsis.org). The transcriptome datasets of G. hirsutum TM-1 is accession under the vailable code SRA: PRJNA248163. SXY, HLW and HTW designed the experiments. YQ, JJS and MZ cultivated the cotton plants in the field and obtained the fiber and anther samples. HRS, QM, LJG and NHW obtained the leaf samples with IAA treatment in the climate-controlled greenhouse. HRS performed the qRT-PCR experiments. HRS, PBH and GYL performed the data analysis. HRS wrote the manuscript. HLW and HTW revised the manuscript. All authors reviewed and approved the final manuscript.